These antique cutlery sets may have come in handy the last time someone told you your mashed potatoes were a little on the lumpy side. The set above dates back to 1715 and the scenarios in which it would have been useful are probably lost to time. But using the weapons would require at least a few seconds of forethought since the barrels actually point directly toward the user. To fire them, the user would have to flip them around and aim the handle of the utensil at the intended adversary. Another set of deadly cutlery ups the stakes (steaks?) a bit by sporting double barrels. 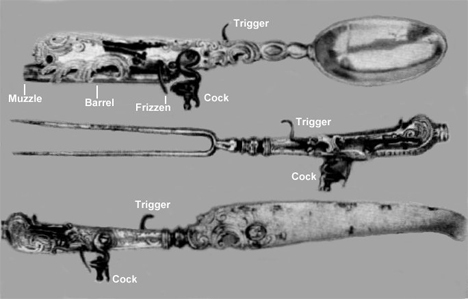 One trigger on each meant that both barrels would fire at once, essentially giving the cutlery-holder the ability to fire four bullets in a second’s time. Although the date and place of origin are unknown, this set does at least keep its barrels pointed away from the user at all times. We are loathe to point out the obvious, but aren’t knives and spear-like forks like these deadly enough on their own? See more in Antique Gadgets or under Vintage & Retro. July, 2014.